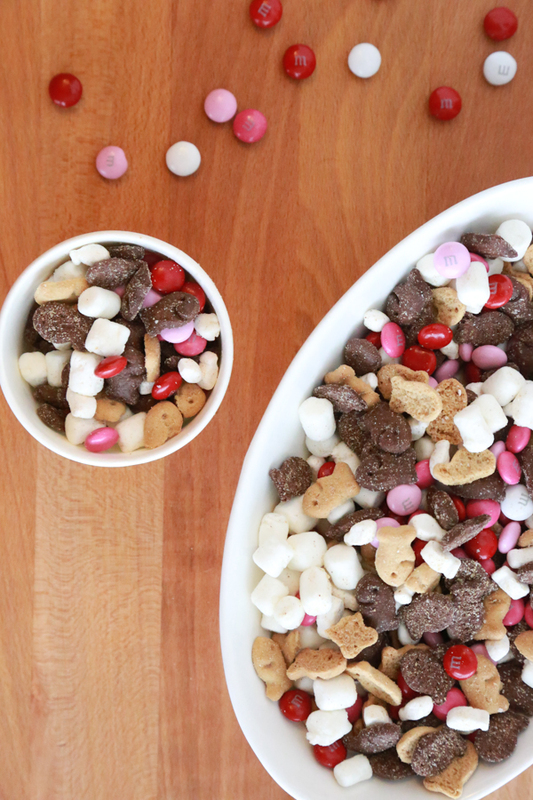 This Valentine’s S’mores Mix is a mix of ingredients kids love! Last week I shared a roundup of Valentine’s Day snack ideas that are guaranteed to bring a smile to your face. From Heart S’mores to Red Velvet Whoopie Pies, there are plenty of snack ideas to appease just about everyone. While I was in the grocery store the other day picking up ingredients to make some Valentine’s Day treats, I noticed a bag of Goldfish that I had never seen before. It may be a new bag, it may be an old favorite, but since I’d never seen it before, I had to grab a couple bags. 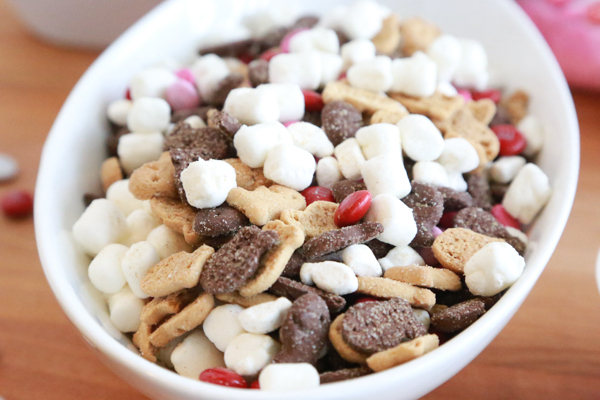 And how perfect for an easy Valentine’s S’mores Mix! 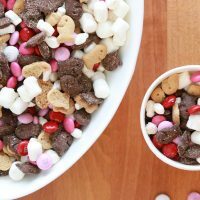 With graham, marshmallow, and chocolate crackers, it’s an absolutely perfect addition to the Valentine’s S’mores Mix. 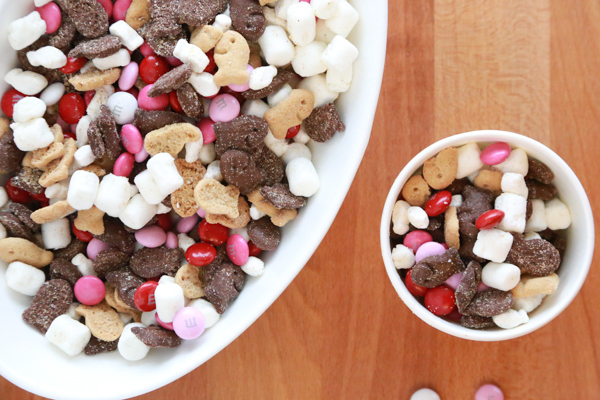 Valentine's S'mores Mix is a perfect treat for Valentine's Day. 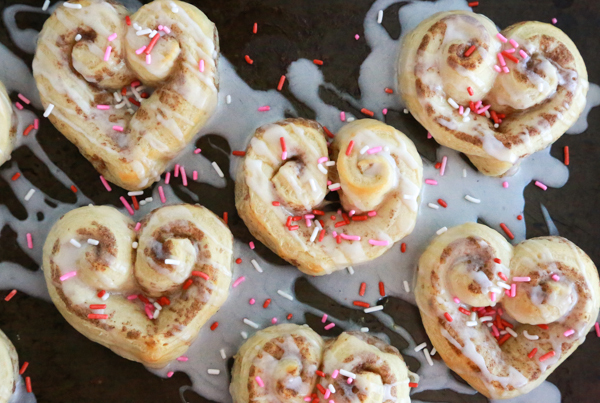 Not only is it super easy to throw together, it's a delicious Valentine's Day snack. Put all ingredients into a large bowl and mix together. Serve immediately or put into small snack bags or boxes for gift-giving. While I know we all love the beloved s’mores, I can live without the mess. 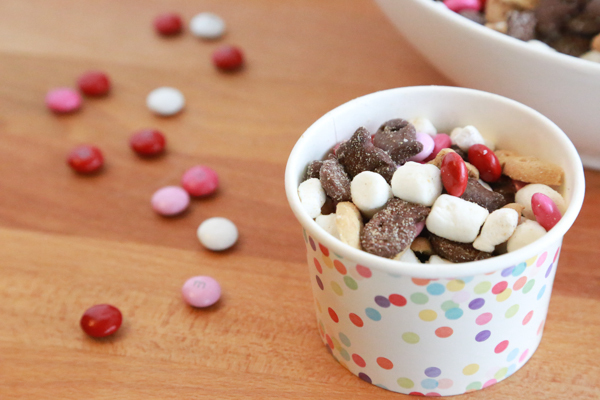 This Valentine’s S’mores Mix allows you to indulge — without the mess. And if your child’s school still allows homemade treats, bag the Valentine’s S’mores Mix in a cute little bag and you’ve got a super simple Valentine’s snack for school! Or you could package it up in a cute, little mason jar and gift it to your child’s teacher, principal or even librarian. 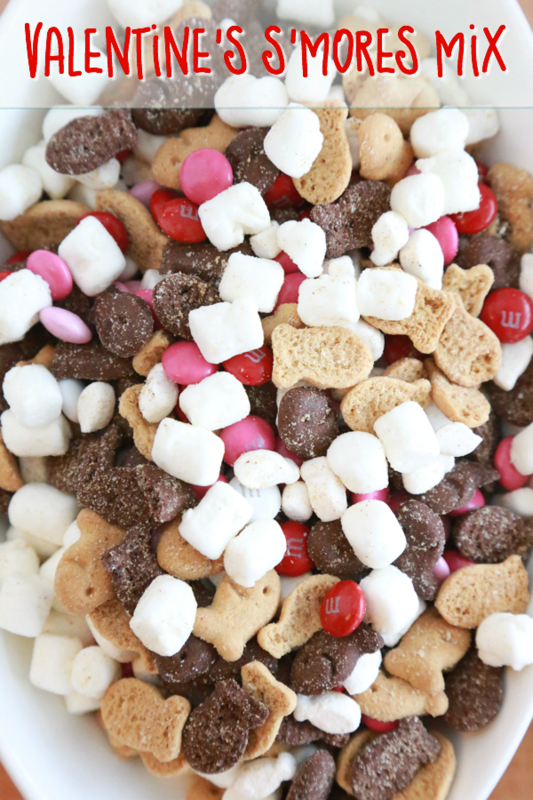 This Valentine’s S’mores Mix would also make a great gift for neighbors, delivery drivers, postal worker, etc. I like to show people I appreciate their hard work, so gifting is always something I look forward to — even if it is just a Valentine’s treat. The next couple of weeks I’ll be sharing many more Valentine’s Day goodies! Make sure you’re following on Twitter, Facebook, Instagram, and Pinterest so you don’t miss anything. I look forward to the decadent treats, lovely flowers, and all the pampering that comes with Valentine’s Day. What’s your favorite part of Valentine’s Day? This looks so quick,easy and fun! I would need to make it gluten free for our house but that woul be an easy thing to substitute gf ingredients. Thanks for sharing! That’s such a creative idea! I think this is the first time I’ve seen a themed snack mix and I’m obsessed! That looks so yummy! I love the look of it, I love the flavors, and I LOVE how easy it is to make. This looks delicious. It has some of my favorite snacks in it too! Smores are one of my favorite flavors, anytime of the year. The goldfish are so cute peeking from the bowl. This snack mix is awesome! I love the original cheddar Goldfish so much and totally feel that this sweet s’mores version is just as good. I made Valentine’s Puppy Chow and I didn’t like it. I think I would like the Valentine’s S’More much more for the special day. This is so cute! What a fun Valentine’s Day treat that all ages can enjoy. Would make a fun jar gift for someone, too. I love all snack mixes, there is just something fun about having a little bowl filled will all these yummy things during snack time lol. I think this is too cute for Valentine’s Day! Easy to make and yummy too? Look like a perfect combo to me! Great for the little ones to much on as well. love this as a valentine’s day treat! I love tha tyou put the goldfish in there. This looks fun to me! I have always enjoyed S’mores. Now you put a sweet Valentine’s Day spin on it? Count me a fan! You can’t get easier than that, and I love that you can grab some on the go! Really cute and fun! That looks so delish, and so very easy to make. 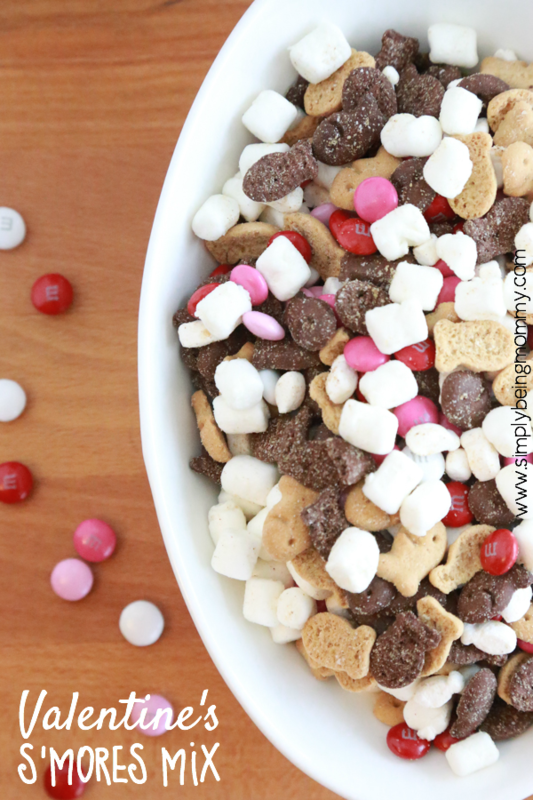 I love the idea of Vday smore mix! Great concept and festive! My kids would love this mix! I love the soft/crunchy blend – so delicious! I always have goldfish and marshmallows on hand and still never thought of this. Love the idea and going to get M&Ms over the weekend to do this for Valentine’s Week. 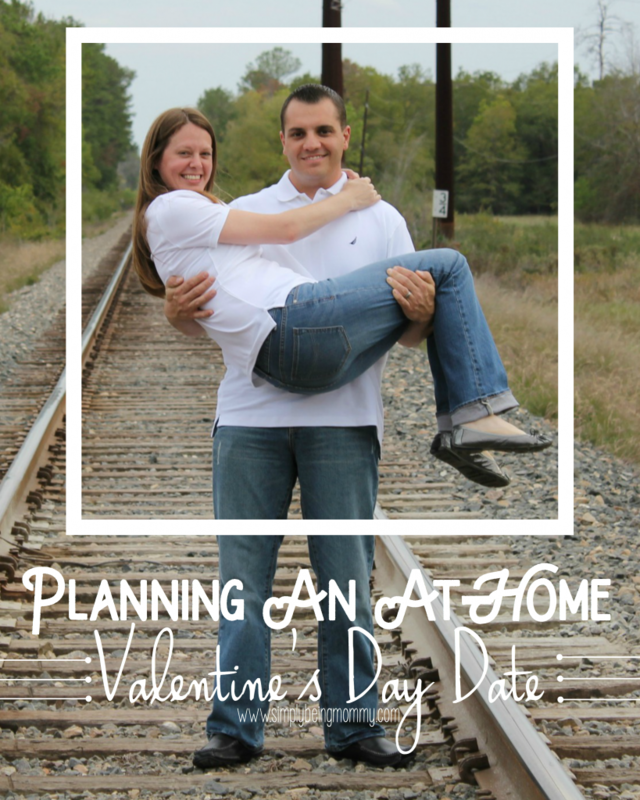 This is such a fun little way to commemorate Valentine’s Day for kids, or adults. I would easily be able to pig out on this during a movie. 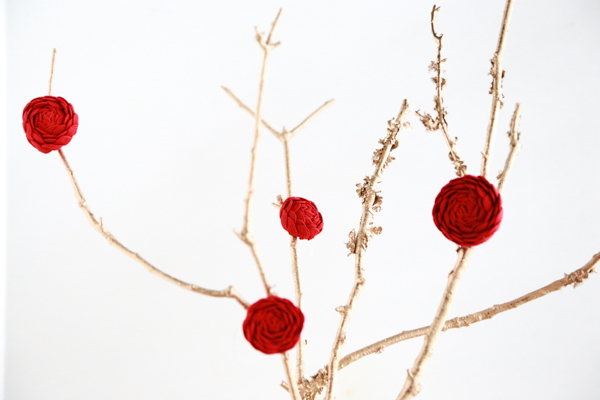 I am totally in love with all of your Valentine’s treats and projects! They are cute and simple, and unique! That looks like such a good snack. i love how festive it is and how easy it is to make. That really is easy. No I have never heard of or seen Goldfish Grahams S’mores Crackers–but for sure I am going to be on the look out for them! Love this fun idea! This looks easy and quick, this is great snack idea. We love M&Ms in our home! I’ll have to try making this some time! My kids would go crazy over it!